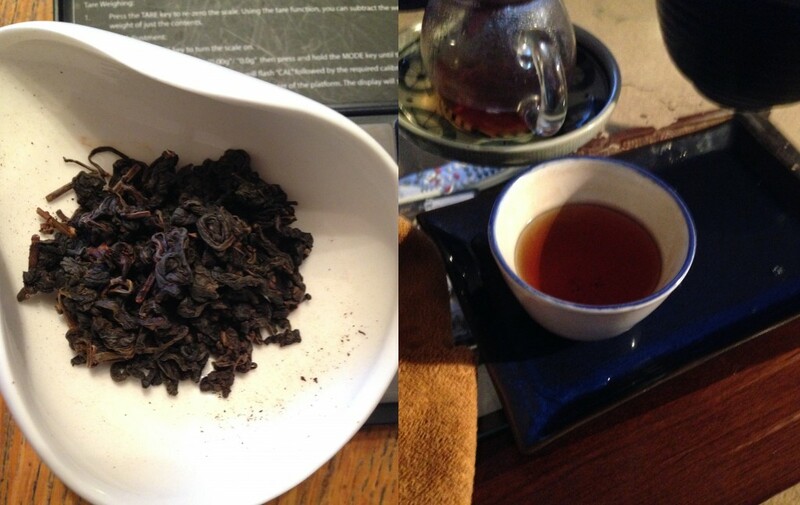 In the month of September 2014, the tea of the month was Aged Oolong. During this month, I had Aged Oolongs at least once a day (unless totally unfeasible). I’ll still consume other teas, but the primary focus is understanding and building a palate for a specific type/genre/region of tea through repetition. This the most personal blogging type style of post for TeaDB, and the goal is to stretch my palate as well as give recommendations to interested parties. Over the past half a year since my previous month of aged oolongs, I’ve grown increasingly more aware of the limitations about the western-facing vendor landscape for aged oolongs. The previous tea of the month really served to break me into the tea genre and introduce me to alot of tea. This tea was mainly mediocre that highlighted alot of the common flaws with aged oolongs, sourness, overroasting, etc. As far as my own personal tea learning goes, I’m really indebted to Tony of the recently closed Origin Tea. Thanks to him and his generosity, I had the opportunity to survey and sample a bunch of aged oolongs, opening up my eyes to a much larger (and better) world of aged oolong tea. Aged oolongs are inherently small productions and kind of like white label pu’erh, as good ones can be a real bargain compared with pu’erh of comparable age. Its a tea genre that I enjoy alot despite it being very niche and tricky to navigate. About 7g/90ml yixing or 4g/60ml yixing. Did not use gaiwan. Single rinse and short steeps. From Seattle to New York.. And then back to Seattle. Despite Floating Leaves being local to me, I acquired several one pot samples via an exchange with Jake of Drinking Teas. Many thanks to him for allowing me to acquire these teas. I’m quite fond of Floating Leaves, despite being a vendor I ended up neglecting over the past year due to spending both entirely too much and entirely too little at Origin Tea before its closure. This is the oldest of all the Floating Leaves tea and also the most sour. The first two infusions were sour and not at all pleasant. By the third the sourness had mellowed a bit into tartness (this is typical of sour aged oolongs). While the tart notes completely disappear by the fourth steep these flaws are not unforgivable and make this Miaoli not a particularly satisfying tea. It teases at some sweet plumminess but it never really comes out too much. Roasty notes come out at the end. Not a terrible tea, but probably not one I’d recommend and not to my tastes. Unclear on the age here, I’d guess perhaps ~15 years. This tea also starts out a bit sour, although not as quite as much as the Miaoli. Similarly, any tartness is completely gone by the fourth steep. Its easier to get sweetness out of this tea than the Miaoli, although the plum is still pretty mild. This was definitely high-fired (or re-roasted) as the leaves are pitch black and the taste of minerals and roast comes out earlier than most aged oolongs (~5th-6th steep). This was my favorite of the Floating Leaves aged oolongs. It is still very lively, with plenty of youth remaining in it. The sweetness is also mild here, and is only balanced out with very mild tartness. This kinda reminds me of semi-aged raw pu’erhs with a dried fruit taste that is different than the plumminess found in slightly older stuff. Good body and longevity. Would order again? Probably. I generally prefer sweeter/less tart aged oolongs. I’d like to give these teas another shot. The Pinglin in particular might be a good buy. These teas from J-Tea were provided courtesy of Jeremy. Major kudos to Jeremy for the recommendation on J-Tea and his own generosity. I have less experiences with J-Tea than Floating Leaves, but have enjoyed the teas I’ve tried from them. This was reviewed in a previous TeaDB episode. The leaves are broken and ugly which allows this 35 year old tea to be pretty affordable. This is a weird tea, and I’ve had a hard time getting consistency out of the brews. The smell of the dry leaves is kinda like a traditionally stored pu’erh. The potential wetness in storage here is not like the sourness/tartness found in many aged oolongs that got wet, but more similar to a pu’erh. The liquor is really dark and the first couple brews taste like slightly heavy storage. The tea is smooth, creamy with some fruit and spice. A nice, very interesting but probably not great tea. This is the most standard of the three aged oolongs I received from Jeremy/J-Tea. Sweet, plummy with good huigan. This is not an overly complex tea and is inferior to Origin’s Meishan Still, I find teas of this profile to be extremely pleasurable. This Dong Ding went for a solid 12-15 brews and is a good example of a well-aged oolong with good source material. Is it worth the $18/oz? Maybe.. Given the lacking landscape of well-aged oolongs, perhaps. I had two sessions with this tea, that were extremely different. This fits into an earthier, creamy, milky, mildly sweet aged oolong profile. I’m not really sure how this or the 1979 Oriental Beauty aged as they are neither sour, nor particularly plummy. Brewed heavier, this tastes creamier and milkier, but brewed for shorter times it is more herbal and lightly fruity. Would order again? Probably. The quality is solid, but the prices are not cheap either. I think the teas here were a small step up from Floating Leaves, but are also more expensive. Origin Tea shutting down simultaneously resulted in my sadness and the largest tea order I’ve ever put in. Tony (the proprietor) has been extremely helpful in both answering my incessant questions on tea and providing me with delicious examples of several different tea genres. I managed to acquire some off the shelf stuff from him before Origin Tea shut down. I’m not going to publish prices here, but I’ll say that everything was very reasonable and compared very well with other vendors. This is my benchmark tea for aged oolongs. Clean, strong plummy sweetness with a great huigan. A really well-balanced tea. Maybe this is average as far as aged oolongs go in Taiwan? I don’t know, but this beats the crap outta just about every tea by other vendors. The bag was labeled as HS. Perhaps that implies Hong Shui (it doesn’t)? Eitherway this tea is good. The compression is slightly tighter than the Meishan and while it smells very plummy it is different than the Meishan. Not as richly plummy as the Meishan, this has a strong body and good overall strength. I don’t like it quite as much as the Meishan but it is a very good tea. If the Hong Shui oolongs I have age as well as this one, I will be very pleased. This tea was stored slightly wet and thus is affordable (unlike cleanly stored 70s aged oolongs). The wetness shows in the beginning with easily discernible but not overpoewring sour notes. The leaves here are really small and the base material was likely mediocre. Still it lasts about nine steeps of earthy and plummy sweet notes. A different sub-genre aged oolongs that I’m not very familiar with. This was originally a green oolong and still retains most of its original greenness. 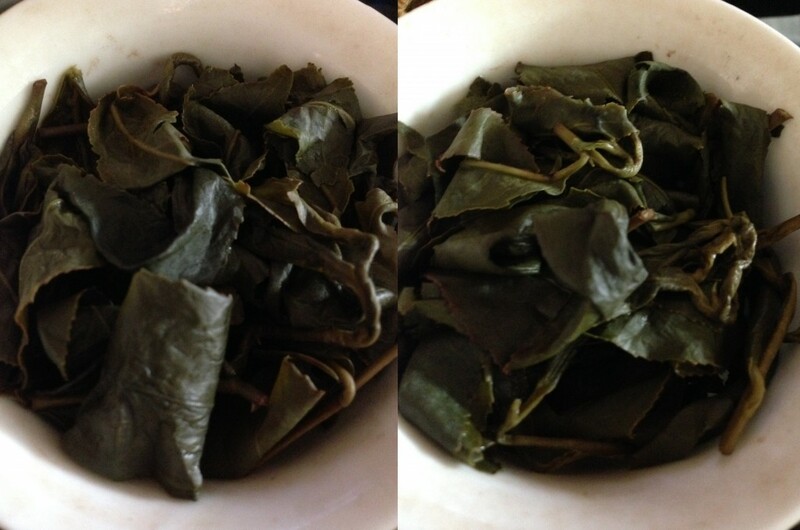 I brewed this side-by-side with some Lishan (also acquired from Origin). Despite obviously not being a bulletproof test, this brewed up with a sweeter, rounder, ripened fruit flavor. A really nice huigan with less crispness compared with the young tea. This has a slighter fruit sweetness than the Meishan and has more of an earthy sweetness, not unlike the 1976 Baozhong. This is a steady performer, with pleasant herbal ntoes. Its base material was likely average as it does not last quite as long as the 1982 Dong Ding from J-Tea. In its defense this tea was also far more inexpensive then that tea. This tea probably got slightly wet and had to be re-roasted. The roast is done pretty well and the tea is mildly sweet and only slightly tart. While it starts out pretty well, it quickly devolves (~five steeps) into generic roasted flavors. Still, the early steeps would be difficult to detect the roast. This tea starts out pretty sour and similar to many teas it evolves into a tartness. This one is almost the opposite of the 1985 Nanyan in that it starts out kinda unpleasant and becomes nicer as it steeps out. ~10 Year Old Vacuum-Sealed Lishan, 2014 Lishan. From Origin Tea. Taiwan Tea Crafts has a huge selection of many things. There are some decent teas to be had, but some are not all that great. I was dreading drinking this tea again as I suspected I may’ve liked it in my aged tea noobness. I was pleasantly surprised. A very enjoyable sweet, creamy, vanilla, with a nice texture. Makes a great affordable alternative for aged pu’erh. Not overly complex and there are some slightly unpleasant wet storage notes in here, but at this price it is hard to complain. This is a tea that I like brewed heavy in yixing with lots of leaf, perhaps giving it two rinses. Also a good target to air out. I can’t judge this tea on the aged tea scale as it doesn’t taste aged to me. While it is not a bad tea, it doesn’t fit any aged oolong profile I’ve ever ran into. I reserve final judgement as I haven’t had a whole lot of aged Oriental Beauty. Would order again? Yes. Sampling from Taiwan Tea Crafts is very easy. Taiwan Tea Craft’s 1982 Sun Moon Lake. I have a better grasp on this tea now that I’ve drank alot more pu’erh. It is slightly creamy, earthy, and sweet. Similar to the 1979 Oriental Beauty this changes constantly and is hard to get a handle on. Not a great tea, but an interesting one. Also acquired courtesy of Jake. This is a very good tea, despite starting out slightly sour/tart for the first two brews. The leaves are nicely intact and likely were very good base material. Smells nice and perfumey. It has a very interesting and distinctive leathery texture with a sweet, plum taste. The huigan is good, but the most impressive part is the longevity. This tea went for 20+ steeps over the course of three days. One of the better teas of the month. Not bad at all. I’m impressed with the humble, but very good teas Cha Wang Shop sells. Despite being only 15 years old, I could’ve easily been tricked to thinking this was at least 5 years older. Very sweet, plum and honey. This is not super complex, but very pleasurable. A great comfort tea. The final tea acquired from Jake and I’m afraid my least favorite. This seems to be an average roasted oolong. I taste very little age here, just a simple sweet, caramelized roast. Weapons of the Month. Hong-ni Aged Oolong Pots. Thoughts & What I learned? I enjoyed this month a great deal despite my increasing cynicism towards the current western scene. I am truly grateful to have picked Tony’s brain and stash to acquire many of these teas. My advice to those interested in aged oolongs, talk to your vendors and keep a discriminating eye. Be wary of any teas that seem roasted or sour/tart. Many of these teas are too low stock to sell on sites and end up being off-shelf. Here’s a couple other things I’ve learned. Heat Matters. Perhaps more than any other tea genre, I’ve noticed the difference using Yixing helps opening up bring out more in these aged oolongs. I don’t think this is due to some fancy clay seasoning but simply heat retention. For some teas this unfortunately means increased sourness/tartness, something that can be partially mitigated with short steep times. 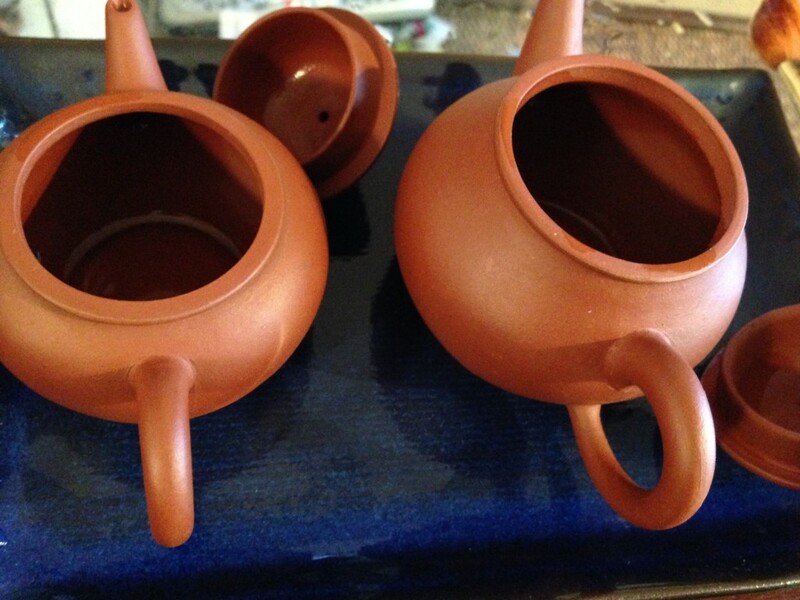 I use a pair of high-fired Hong Ni pots which retain heat extremely well for my aged oolong brewing. Price to age is good. In between the two tea of the months I’ve drank alot of pu’erh. This has helped me to identify and understand a few of the teas better (1962 Toufen, 1979 Oriental Beauty, etc.). 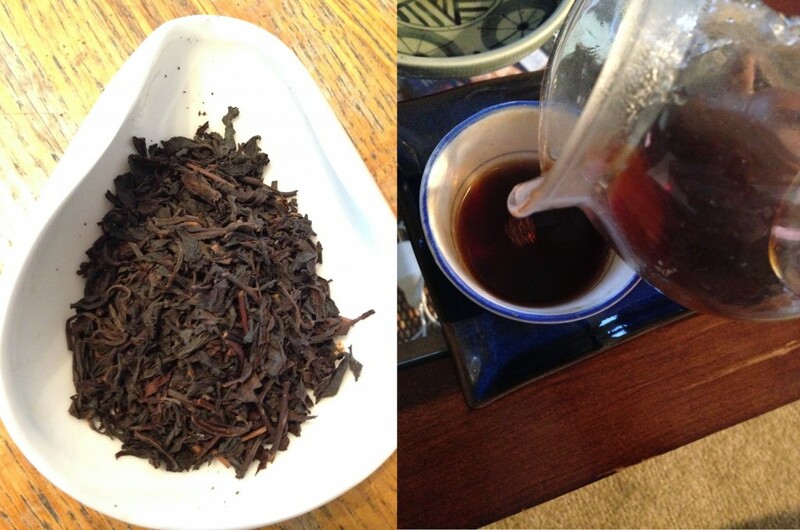 Compared with pu’erh, aged oolongs are a very affordable way to acquire aged tea. Heicha might be another good outlet, but I know far less about that tea genre. Aged oolongs don’t seem to brew for quite as long as pu’erh (although this is variable) but can follow similar profiles without the extreme pricetag. Also similar to pu’erh, it is easy for vendors to lie or be mislead about age or about the tea being re-roasted or not. It is also worth noting that the teas this month were all-around better than the previous aged oolong month. In my opinion, the Floating Leaves and J-Tea’s aged oolongs despite are pretty unanimously better than Camellia Sinensis and Taiwan Tea Craft’s aged oolongs. 25 Year Old HS Origin Tea Very Good. 25 Year Old Meishan Origin Tea Excellent. 1984 Dong Ding Origin Tea Good. 1976 Baozhong Origin Tea Good+. 10-Year Aged Lishan Vaccum Seal Origin Tea Very Good. 20 Year Old TGY Origin Tea Good-. 1985 Nanyan TGY Re-roasted Once Origin Tea OK+. 1979 Oriental Beauty J-Tea $15.00 28.35 $0.53 Good. 1982 Dong Ding J-Tea $18.00 28.35 $0.63 Very Good. 1984 Baozhong J-Tea $16.00 28.35 $0.56 Good+. 1994 Oriental Beauty Taiwan Tea Crafts $16.00 25 $0.64 OK.
1982 Black Taiwan Tea Crafts $4.25 25 $0.17 Good+. Pinglin (~20 years old) Floating Leaves $13.00 28.35 $0.46 Good+. 1980s Miaoli Floating Leaves $13.00 28.35 $0.46 OK.
Muzha TGY Floating Leaves $15.00 28.35 $0.53 Good-. 1982 Baozhong Everlasting Teas $15.00 28.35 $0.53 Very Good. 1963 Toufen Camellia Sinensis $8.67 10 $0.87 Interesting. 1999 Anxi TGY Charcol Roasted Chawangshop $2.80 10 $0.28 Good+. Mystery Aged Oolong (Jake) OK-. Next up for October: Shu Pu. This entry was posted in Aged Oolong, Anxi Oolong, Article, Drinking Report, Long-form Article, Oolong, Taiwanese Oolong, Tea Learning, Wuyi Oolong and tagged Camellia Sinensis, Cha Wang Shop, Everlasting Tea, Floating Leaves, J-Tea, Origin Tea, Taiwan Tea Crafts. Bookmark the permalink. That 1982 Baozhong is really something. Very clean and great profile. Definitely high quality base material, in fact they sell a fresh Baozhong from the same farm! The Mystery Aged Oolong is from a shop that sells Pu’erh in Taipei. I recently got another aged oolong from them that blows the Mystery Aged out of the water. I reviewed it on my blog. Also have some sheng from them, some of it is quite good, some of it is just flat-out bad. Not a very curated shop, it seems. To anyone reading this: note that sourness isn’t necessarily a bad thing in an aged oolong. I personally don’t mind it, and I think it can add to a tea sometimes. I personally liked the Miaoli quite a bit, for example. Thanks for the comment. I agree that 1982 Baozhong is quite good. Have only had one session of it, but hope to enjoy it a few more times! As you say, sourness (as do most characteristics) depends on the individual’s tastes. I am generally not a huge fan of it, and while I can forgive mild tartness sourness is enough to ruin an aged oolong for me. I’m curious if you noticed any “cha-qi” on any of these? Specifically body feel, mental effects, or maybe something else beyond the normal taste and aroma. Thanks for the comment and that’s a good question. Frankly speaking, I find that I rarely get what is described as cha qi (or most unusual special body effects). I have a few times from high-grade Yancha or older tree pu’erh. However even in those instances, I’m not 100% confident I can recreate the same results. None of these teas (from my sessions) stood out as having anything unusual in terms of body effects or cha qis. I also suspect that these effects have just as much to do with the base material (rather than the aging). J-Tea prices have skyrocketed looking in 2017. I just checked. Looks like it has ~doubled or so.